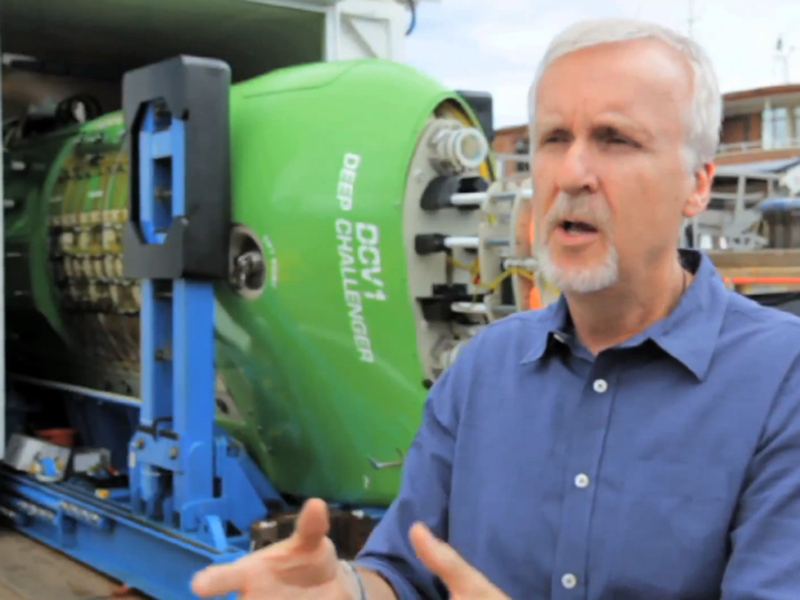 (CBS/AP) Director James Cameron has gone were no man has gone before: to the deepest depths of the ocean. Late Sunday, partnering organization National Geographic announced his ocean submersible had reached a depth 35,756 feet; "a figure unattainable anywhere else in the ocean." Upon arrival, the filmmaker typed out welcome words for the cheering support crew waiting at the surface: "All systems OK."
Cameron set out on his journey Sunday to someplace only two men have gone before  to the Earth's deepest point. The director of "Titanic," "Avatar" and other films is using a specially-designed submarine to descend nearly seven miles to the bottom of the Mariana Trench, an area 200 miles southwest of the Pacific island of Guam. He began the dive at 5:50 a.m. Monday, local time, according Stephanie Montgomery of the National Geographic Society, where Cameron is an explorer-in-residence. "RELEASE, RELEASE, RELEASE!" were the last words Cameron uttered before beginning the dive, according to a Twitter post from the expedition. The scale of the trench is hard to grasp  it's 120 times larger than the Grand Canyon and more than a mile deeper than Mount Everest is tall. It was expected to take Cameron 90 minutes to reach the bottom aboard his 12-ton, lime-green sub called "Deepsea Challenger." Once there, Cameron planned to spend six hours collecting samples for biologists and geologists to study. The return trip to the surface was forecast to take 70 minutes. There's considerable wiggle room built in, however, as the submarine Cameron helped design has the capability to support life for a 56-hour dive. The first and only time anyone dove to these depths was in 1960. Swiss engineer Jacques Piccard and U.S. Navy Capt. Don Walsh took nearly five hours to reach the bottom and stayed just 20 minutes. They didn't have much to report on what they saw there, however, because their submarine kicked up so much sand from the ocean floor they couldn't see much. One of the risks of a dive so deep is extreme water pressure. At 6.8 miles below the surface, the pressure is the equivalent of three SUVs sitting on your toe. Cameron told The Associated Press in an interview after a 5.1 mile-deep practice run near Papua New Guinea earlier this month that the pressure "is in the back of your mind." The submarine would implode in an instant if it leaked, he said. But while he was a little apprehensive beforehand, he wasn't scared or nervous while underwater. "When you are actually on the dive you have to trust the engineering was done right," he said. The latest dive site, which is at the deepest point in the Mariana Trench, is named Challenger Deep after the British naval vessel HMS Challenger that used sound to first measure its depth. The film director has been an oceanography enthusiast since childhood and has made 72 deep-sea submersible dives. Thirty-three of those dives have been to the wreckage of the Titanic, the subject of his 1997 hit film.